High 5 Moment: High 5 Casino’s Month In Review for February 2019! 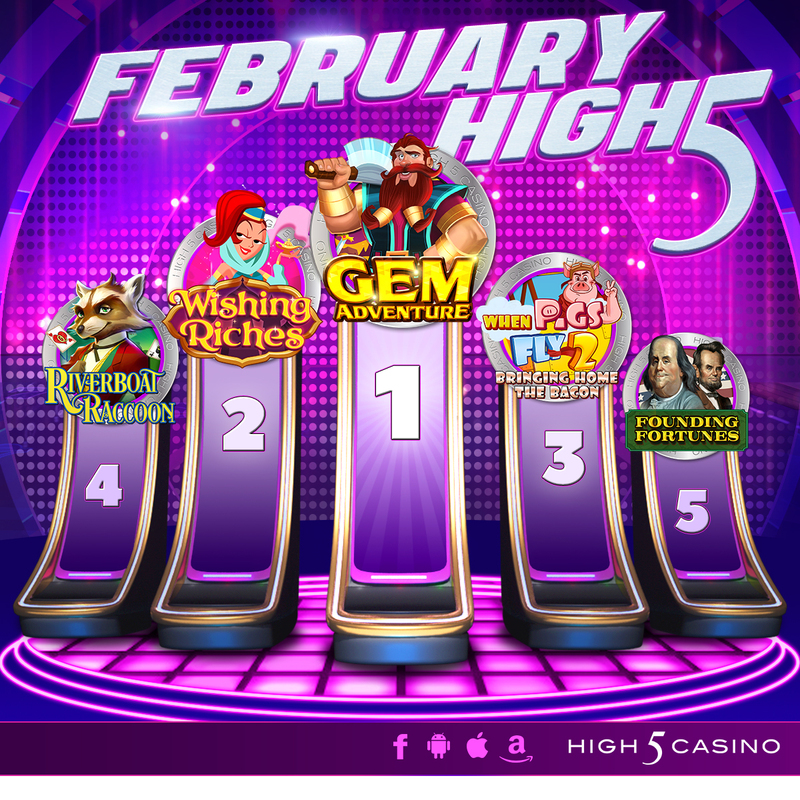 Love was in the High 5 Casino air this February! High 5 Casino fell head over reels in love with the FOUR new games to enter the casino lobby! 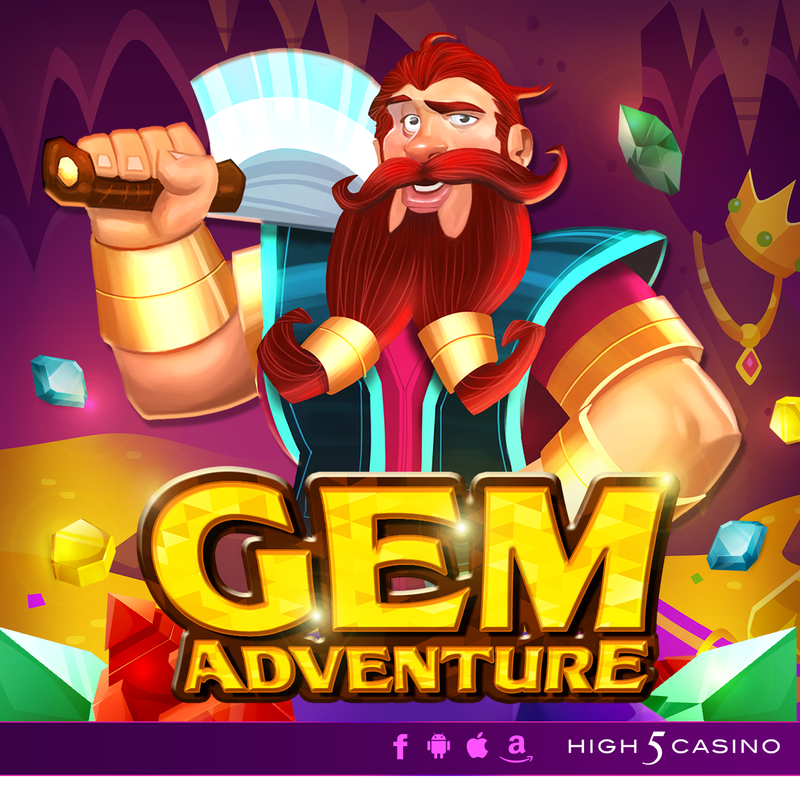 As of February, H5C released 295 slot games, including Gem Adventure, Wishing Riches, Riverboat Raccoon, and Triple Buffalo! With each new game, there was an exciting weekend-long XP event to follow! Featuring an XP boost in selected theme games, you took advantage in leveling up faster while playing during the Enchanting Gems XP, Struck by Love 5XP, Southern Heat XP, and Triple Spin 3XP! During February, players were treated with the return of Founding Fortunes to celebrate Presidents’ Day! From Tuesday, February 12th to Tuesday, February 19th, you celebrated Presidents’ Day with these famous presidents, founding fathers, and Double XP in this fun American-themed slot game! Players also enjoyed a 5XP BOOST in H5C’s most romantic games for Valentine’s Day weekend, leveling up FIVE TIMES FASTER in Hearts Aflutter, Teddy Bucks, Shipwrecked Lovers, and Love U! H5C also introduced players with a brand new feature! Now available for both desktop and the H5C mobile app, you can now Favorite your most-liked slot games by giving them a heart! You can even sort your games by FAVORITE in the pull-down menu, being able to keep your most-liked games in the front of your list! Have you tried it out yet? Players ended the month of celebrations with 2XP in Chilli Gold for National Chili Day! Beware of the fire-breathing dragon! Meet the dwarf king’s son Fafnir! With his powerful arm and a fearless soul, he guards his father’s kingdom that is full of gems. Fafnir would not let anyone near these treasures, no matter what! As he continued to protect the treasures, he found himself feeling overtaken by greed so greatly, it turned him into a dragon! Now, people from near and far visit the kingdom, trying to get past the dragon and claim the gems for themselves. On this Gem Adventure, use Split Symbols and Super Stacks to defeat the dragon and claim your riches! Do you have what it takes to complete this Gem Adventure? Comment in the conversation bubble located on the top right corner of your screen and let us know what you think!